Despite all of the trouble in the past, many trainers eagerly signed up for the tournament. The draw of gold in addition to the fame of winning a Heart Island tournament was simply too much for many to turn away. Invitations went out, and one by one, the Trainers arrived at the island. They were given a night to settle in their rooms, and on the following morning, they were led out to a stretch of beach. 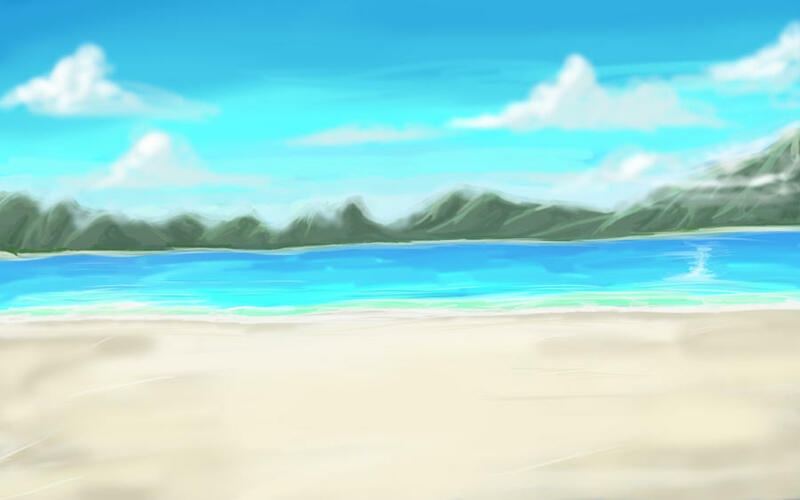 The sand was soft and warm, the waves sparkled, and the wild pokemon of the island called out to each other. Mistress Heart's chair sat on a small driftwood dais built in the sand. She smiled at the trainers as twenty-six gathered around her. Most of them were wearing different colored handkerchiefs to keep the heat off. She opened her mouth to speak. "YOU!!!!!!!" Everyone stared as a woman in blue handkerchief suddenly tackled a man as he entered the circle. "Magma scum!!! How dare you come here?!?!!? This is our turf!!! The sea is ours!!!!!!!!! LET THE SEA REIGN!!!!!!!" "This is land and that makes it ours!!!!" The man shouted as she shoved her off. "Hariyama, break this up!!!" Mistress Heart called out. Hariyama materialized out of his ball, and held one of the trainers in each hand. They still struggled toward each other. The man's red handkerchief had fallen to the ground. Mistress Heart lifted it and uncurled it. On it was a dark M which resembled a volcano. She stepped to the woman, who didn't even notice as her handkerchief was removed from her head. On it was an odd sort of A which seemed to be made out of bones. "Take them away Hariyama." Mistress Heart returned to the dais, a handkerchief in each hand. "Well, I suppose I should have been expecting this. Even with all of the extra security precautions, pokemon thieves have managed to make their way into my tournament. Very well. We shall do this again. I know that there are many true trainers here. Figure out who are the thieves among us." Mistress Heart sat in her chair, and the game began. 1) The first day will not last any more than 7 real life days. After that, “days” will be 72 hours and “nights” will be 48 hours. 10) Votes must be bold and red. You must unvote before you revote. Self votes are allowed. No-lynches are not. -----Focus Energy: Makes target's attack more likely to succeed. Ok I think that's all of the emails out and correct. Now we know who doesn't read in directions. You must *giggle* at least once in every post for the next 24 hours. I'd you mean not all PMs have been sent? You read the PM, I'd not posted saying that they'd all been sent out yet, and it really won't hurt you to laugh a little more. That was too manly to be a giggle! Someone fix that. Stupid work computers and stupid DM. Meep - no want to giggle. Berf with the first code fail. MOD, Are self votes and no lynch votes allowed? I don't see anything in the rules re: either. Modkilled on the first page for self-voting. That'd go down in history.